Serve up a frozen treat! Description: This is one of the most unique sno-cone machines on the market! 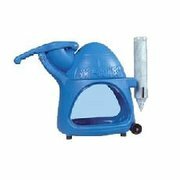 The Cooler sno-cone machine from KINDAS is a great option for any sno-cone party. You wanted a unique, smaller, more portable sno-cone machine and we've got it! The Cooler has wheels and is made from rugged roto-cast polyethylene so its lightweight and less expensive. It has the same heavy-duty motor and hard-wearing components as KINDAS' other metal models, but the design is a real attention-getter. Features high-imapct polycarbonate side panels making it safe and easy to clean with a blue tint to shade the ice and prevent melt down. Requirements: You will need a table or counter to set the Sno Kones machine on while in use.